When it comes to getting the best picture from your retro-consoles, you all should know that RGB is the way to go and that SCART is the easiest way to get RGB from most retro consoles. If you’ve not already read our gamers guide to SCART, you might want to go there first to see why it’s worth going to all the trouble of getting SCART and SCART switching to work correctly. In that article we talked about the different types of SCART switch and established that there are only two types (which I’ve named passive manual and auto with manual override) that are generally compatible with games consoles. Unfortunately, it’s not as easy to find a fully compatible SCART switch as it should be, it seems that manufacturers cut corners on SCART switching to save money. While these deficiencies don’t usually show up when using video recorders or DVD players, they can play havoc with the specially built SCART cables that many older games consoles require. SCART switching – why so many issues? As explained in our gamers guide to SCART, SCART is a 21 pin connector. For a switch to be fully compatible with all possible configurations, a SCART switch should switch and isolate all 21 pins. In practise, most configurations will work if only the pins for Red, Green, Blue, Sync, Audio Left and Audio Right are included in the switching. Furthermore, many switches do not fully isolate one socket from the other. Again, this is fine in the majority of cases, but what tends to happen is that the signal becomes degraded as it passes through the switching matrix, usually losing brightness. Note:- SCART is not strictly speaking, a hot-plug standard. That means that, really, you shouldn’t disconnect and reconnect equipment without powering it down first. While writing this article, however, that is exactly what I did, and I managed to get away without breaking anything, although I still wouldn’t recommend it. Brightness/picture noise:- The most common degradation when using bad SCART switches is loss of brightness, followed by picture noise. When testing a SCART switch for these problems, make sure that you fully populate the switch (in other words, make sure every socket on the switch has a SCART plug in it). Then, compare the brightness of the picture on at least two of the inputs, versus what you see when you plug the SCART cable directly into the display/processor. Check for any added picture noise too. Isolation test:- This one’s easy, fully populate your SCART switch and switch it over to the first input. Now, power on every other input on the switch. A properly made SCART switch should not be affected by this, but the more cheaply made ones will show a picture degraded by the other inputs, or even a picture made up of the signal from several inputs. Below are some quick reviews of the SCART switches I’ve personally tested. 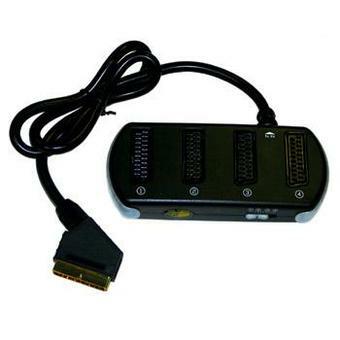 If you have your own SCART switch that works well with games consoles, please leave a comment so that other people can benefit from your experiences. To de-clutter this page, I’ve now split each switch review onto it’s own page, with a quick summary of the review on here. Review summary – A good switch, spoiled by the lack of a manual override and build quality/reliability issues. 7 out of 10. Click here for the full review. Review summary – The Extron Crosspoint really is a class above the typical SCART switch, but it’s a finicky beast, demanding clean sync input and requiring special breakout cables for all your consoles. If you have a complex setup with multiple displays, processors and/or capture cards, and you’re tired of chaining regular SCART switches together and want a high quality low clutter solution, the Crosspoint could be for you. Just remember to factor in the cost of getting all your systems correctly cabled up. 8 out of 10. Click here for the full review, or click here for the picture gallery. Availability – Still available on the web. Review summary – Not the prettiest bit of AV gear, but a solid performer. 8 out of 10. Click here for the full review. Review summary – Basically a good switch, but loss of brightness is disappointing. 6 out of 10. Click here for the full review, or click here for the picture quality gallery. Review summary – As close to perfect as you’re likely to see in a SCART switch. 9 out of 10. Click here for the full review, or click here for the picture quality gallery. Review summary – The best budget SCART switch we’ve tested. 9 out of 10. Click here for the full review, or click here for the picture quality gallery. Availability – Widely available from E-bay and online. Review Summary – Frankly, we’d rather get up and swap the cables over manually than use this thing. 2 out of 10. Click here for the full review. Review Summary – A solidly built switch, but not without its problems. At this price we would have expected perfect. Click here for the full review, or click here for the picture quality gallery. Review Summary – A fantastic high quality SCART switch, if you can still find one. 9 out of 10. Click here for the full review. Review Summary – Perfect performance, great aesthetics, a truly outstanding RGB switch. 9 out of 10. Click here for the full review, or click here for the picture quality gallery. If you need more outputs from your SCART switch, you can always add a secondary splitter. Below is a list of several we’ve reviewed. Review Summary – A handy little gadget, if you can ever find one. 8 out of 10. Click here for the full review. Review Summary – Flawless in operation and built to a high standard. An ideal way to split out any SCART signal. 9 out of 10. Click here for the full review and picture gallery. I’ll list any SCART switches that have been tested by other gamers down here. I have not tested most of these devices personally so cannot comment on the accuracy of the reviews. 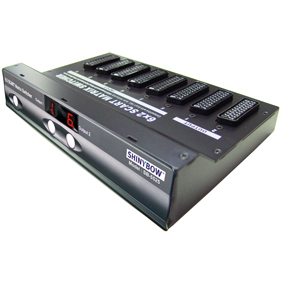 5 way SCART switcher splitter switch box (black, push button, looks like a door step, as sold by Oakfield Leisure on E-bay) – Not recommended – picture significantly dimmed (XRGB3 user ‘Rock Man’). Bandridge Premium Performance 5-Way SCART Selector – Recommended (User Thomago in shmups forum). Bandridge Premium Performance 5-Way SCART Selector – Not Recommended (User @Tryumph4ks on Twitter) – Sockets are not correctly isolated from one another. 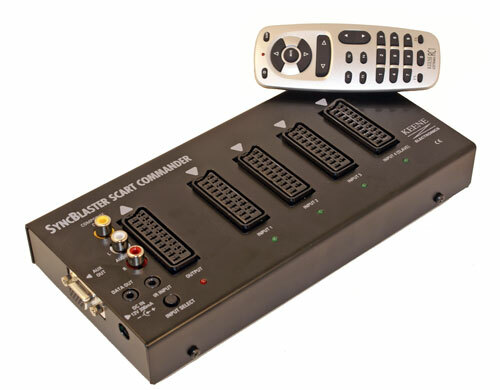 Joytech AV Control Center JS965 – Recommended (Konsolkongen from Shmups forum). 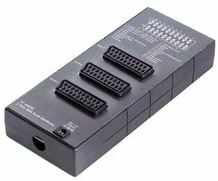 Logik Audio/Video 4 in 1 Multi SCART Adaptor – Not recommended (Sega Saturn UK forum) (no manual override?). Shinybow SCART Matrix 6:2 Switch – Recommended (shmups forum). 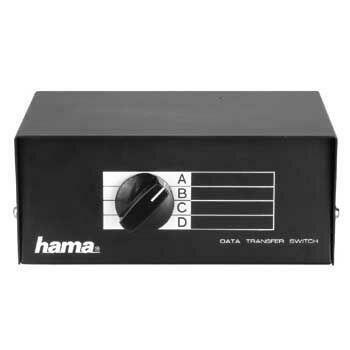 There are a bunch of switches that look very similar to Hama AV Selector 100S on eBay. Is it possible that Hama is just putting their brand on non-brand switches? Or the others are just knock-offs? Very good question, unfortunately as far as we’ve seen it is the latter. Hi, great roundup. I have a theoretical question regarding the AV signal direction and it’s affects on the devices in the setup. Can directing input/output scart switcher into opposite direction damage or affect the game console? 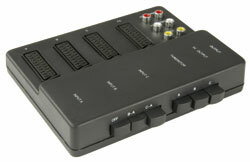 I am using a scart switcher to connect the game console to the TV set. The console of course only has output port. The console’s output port is connected to a scart adapter which has input/output switch button and then it is further connected to the TV’s input port via regular scart cable. The image from the console shows in both cases, whether I switch the adapter to the input or output, with a difference that if it is switched to the ‘opposite direction’ (to send the signal back to the console’s output port), the image quality is dimmed and the sound is a bit distorted. But the picture and sound is still somehow showing on the TV. – how is it possible that the signal, which is originally sent from the console, successfully travels through to the TV’s input, when it is continuously being redirected and sent back to the console by the adapter? – can prolonged usage of a “wrong direction of signal” (in example sending scart signal to the console’s *output* port) affect or damage the console in any way? – also when two or more scart signals interfere in one channel (in example when using scart splitter with multiple devices sending output to the TV’s input at the same time), is this affecting or bad for any device in the set up? 1) Likely your SCART switch doesn’t isolate all pins so they are still connected regardless of input or output mode. 3) It can be, since SCART carries voltage too. Regarding the second question, the output pins on the SCART end of the cable are probably not connected to the console end at all. You mean the adapter? That is true. Specifically it is this adapter: http://www.amazon.de/gp/product/B000VFBOC2. The scart end of Wii cable connects to this adapter. So you are saying that the signal, even if it being sent back to the console, it does not go further than adapter? I was talking about those custom consoles SCART cables (no adapters required). But anyway, most consoles have either some flavor of DIN or a proprietary connector as output. Those connectors have only output pins, but no input pins. So, even if it is a standard SCART connector on the other end (which have input pins), the SCART input pins are probably not connected to the console at all. Another thing, I thought you were using a SCART RGB cable from the console, but now that I saw the adapter I understand that you are using a standard Composite (or S-Video) cable. You may consider using component cables to get better image (or SCART RGB cables if you have a PAL Wii). And yes, the console has proprietary connector as output. Okay I understand better now, thanks. About my third question, @BuckoA51 wrote in the article that bad scart switchers might even give you “a picture made up of the signal from several inputs”. Unfortunately I bought a pretty low quality scart switcher, and in one moment I tested both Wii and Wii U, or the Wii and TV, at the same time and the picture showed mixed up garbled signal. Can this be dangerous for console, TV, or cables in the set up? Can it affect the quality of reproduction? Use a proper RGB cable with your consoles, composite video means terrible picture quality. As for the mixed signal being dangerous to consoles, yes in my experience this is definitely the case. With one cheap switch I actually saw my SNES power up when it wasn’t even plugged in, just from the voltage leaking back through the SCART switch. I wouldn’t think that this was the best way to be powering your consoles. Thanks. That is some scary info about the scart technology. I will take better care when using it in the future then. The scart splitters as well as the automatic scart switches will turn on more than one NTSC console at a time because there is no isolation between the sockets. There is a pin on each consoles multi out that outputs 10v on it instead of not doing that on a pal console.. this pin from each console connects to the same pin on the scart connector. thats why your super nes will turn on your sega genesis at the same time on a scart splitter. the genesis is being backfed power through the scart connector from the snes. I have had good luck with Recoton RSB05 switches. They sometimes come up on eBay from UK sellers. There is also an identical-looking switch being sold on eBay that are crap, so watch out – look for the model number and rectangular outline on the front, that’s the easiest way to tell the difference. 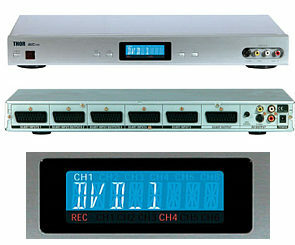 Does anyone have experience with Okano AV-310? Powered automatic switch, seems like a german company (and available mostly from german ebay traders). 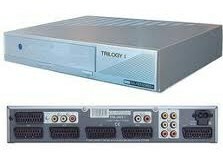 A seller at swedish auction site Tradera claims perfect isolation and signal integrity. Uhm.. You list one user that recommended the bandrige and immediatley after a other one that says it’s no good..? Oh-kaay…. I found this generic scart box http://www.ebay.co.uk/itm/302214299511 which is listed as fully wired, so I decided to give it a shot and grab it along with this scart coupler http://www.ebay.co.uk/itm/302218188343 (from the same guy) to split my video signal between my Trinitron TV and my PVM monitor, by connecting it backwards. It worked! My video signal travels quite a distance across the room before going into this box, but I can’t see any significant quality loss, with only one display being turned on. If I turn on both displays at the same time I experience noticeable brightness drop, but otherwise it’s OK. So this option could be useful for anyone who want to split thy games this way and spend less.